Everybody Wins! Iowa has very dedicated mentors from all walks of life. This month, we are taking a closer look at our college students who work with us in a variety of ways. We have student interns, site-coordinators and mentors. The universities that we have represented are Des Moines University, Grand View University, Central College, Simpson College, and Drake University. 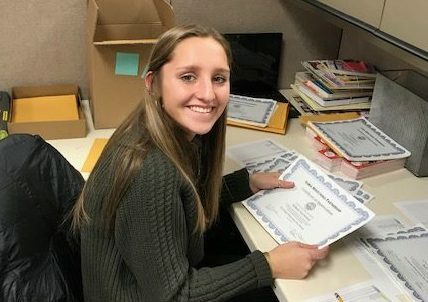 This year we have one dedicated I-CAP student, Emily Andrews from Grand View Univeristy, who is helping with capacity building as well as serving as a site coordinator. We also have an intern from Central College (Mikaela Erickson). Our site coordinator at Hubbell is from Grand View (Lesllie Perez) she and Julie Pitman (Grand View) were mentors at CPC and office volunteers last semester. Our site-coordinator in Indianola (Sadie Cahalan). In addition to these students we have a group of volunteers from DMU at our programs at CPC, Oakridge, King, Greenwood and Oviatt Elementary. Stephen Meyer who is a first year student at DMU has shared that he has seen a great amount of growth in his student. 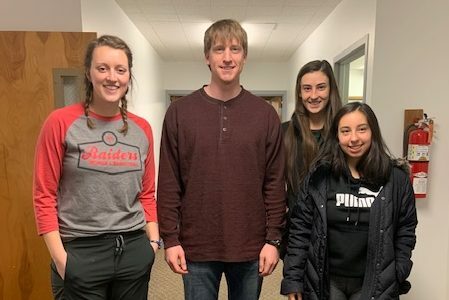 They enjoy puzzles and he says he, “enjoys that his student is very dedicated to challenging herself to finish the puzzle.” Another reason that students say they mentor is because they want a way to give back as people gave to them when they were children. This was the case for Molly Cunard who is a 1st year student at DMU as well. One of our Simpson students is Shelby Miller. She read at Lovejoy in the fall and will be at McKinley this semester. She is an elementary education major and she says that she wanted to join the program because, “I have a passion for helping others and working with children. I love to read and share that love of reading with students.” She hopes to use the experience she has gained from mentoring in her classroom teaching after graduating. Everybody Wins! Iowa thanks these students and the others not mentioned for your dedication and service. If you know of a college student that would make a great mentor or site-coordinator please send them our way.